The Export Growth China event lets small and medium sized Australian businesses reach a global audience. 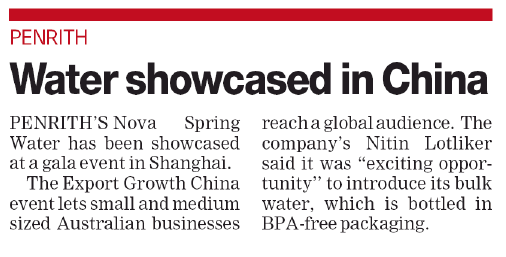 The company’s Nitin Lotliker said it was “exciting opportunity’’ to introduce its bulk water, which is bottled in BPA-free packaging. Published on Penrith Press on 28 Aug 2015.